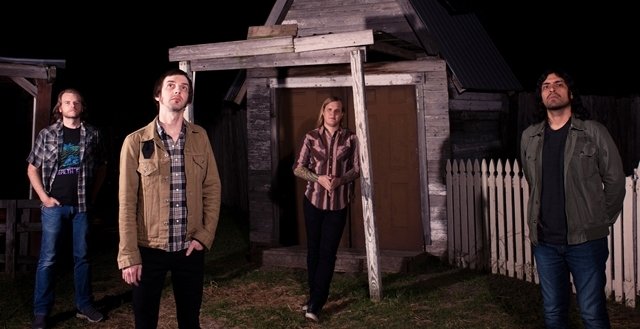 The Sword today unveil the cover art for their fifth album, High Country, scheduled for release on August 21st on Razor & Tie. The artwork can be seen at www.theswordofficial.com. At the same site, the title track “High Country” can also be streamed. As with their previous release, Apocryphon, High Country will be available today for preorder through Razor & Tie as well as the band’s merch site. Access to both preorders is at www.theswordofficial.com The Razor & Tie preorder includes multiple bundles featuring double colored vinyl, cassettes, three t-shirt designs, a hoodie, as well as a lithograph of the album art. The CD and double vinyl can also be preordered as standalone pieces. The band’s preorder features one bundle which includes the CD, an exclusive double colored vinyl with earth and sky printing, a custom engraved and numbered stash box with album art featured on the inside the of the lid, a custom shredder card, a custom packet of rolling papers, and a custom engraved dugout. The band will also be releasing at the store new t-shirt designs. As previously reported, the band will be commencing a Europe/ UK/ Scandinavia tour August 21st. An extensive North American tour commencing in October will be announced in August.